The ministerial committee has been constituted to frame a law, and the government plans to bring this legislation in the Winter Session of Parliament, functionaries said. NEW DELHI: The Centre has proposed to bring in a legislation in the winter session of Parliament to make the practice of Triple Talaq a crime. 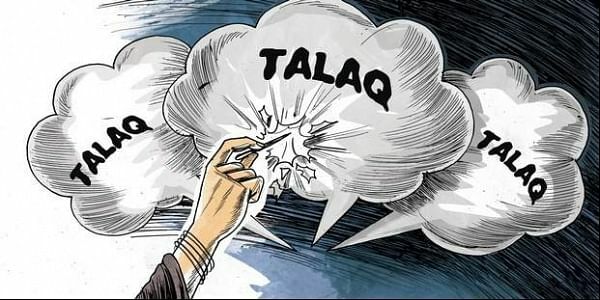 The Supreme Court banned the practice, through which men in some Muslim communities could divorce instantly by uttering ‘talaq, talaq talaq’, in August. A ministerial committee has been asked to draft the law. Minority community leaders suspect the Centre has timed the announcement to influence the Gujarat polls. Advocate Zafaryab Jilani, who represented the All India Muslim Personal Law Board in the Supreme Court, described the government’s move as “propaganda”. “This information is being planted by the government to influence Gujarat voters,” he alleged. According to government sources, there have been reports of a number of instant divorces, also called Talaq-e-biddat, despite the Supreme Court’s judgment. This could be because of lack of deterrent punishment, sources said. “As the law stands today, a victim of Talaq-e-biddat would have no option but to approach the police as the Muslim clergy would be of no assistance to her. Even police are helpless as no action can be taken against the husband in the absence of punitive provisions in the law,” said government sources. They said the new law will empower Muslim women. The committee that has been set up to draft the law is likely to have Union ministers for law and justice, women and child development and minority affairs as its members. Earlier, the government had turned down the demand for a separate law to make Triple Talaq a crime. In August, the Supreme Court struck down the controversial Islamic practice of instant divorce or 'talaqe-biddat' as arbitrary and unconstitutional. November: Yasmeen Khalid, wife of AMU professor Khalid Bin Yusuf Khan, alleged she was given instant divorce by her husband on WhatsApp. But there have been reports of a number of divorces by way of 'talaq-e-biddat' even after the judgement, the functionaries said.